When we left the gang in season 2, Nick and Jess rode off into the sunset after deciding to “uncall it” following Nick’s heartfelt declaration, “Look, I know you think we should call this. But I don’t want to give up on this, even if we don’t know what this is. I want to uncall it. Please, can we uncall it? And before you say no, don’t say no.” The premiere picks up minutes after the finale, where the couple follows one spontaneous decision with another and take an impromptu trip to Mexico. Chaos in Mexico as Nick and Jess try to figure out what it means to be in a relationship is guaranteed. Schmidt must make a choice between his college sweetheart, Elizabeth and runaway bride, Cece. Producer Liz Meriwether hints that Schmidt faces a real dilemma in the premiere and “hopefully the audience goes with us for the choice he makes.” For new-ish faces, Coach (Damon Wayans Jr. of Happy Endings) makes his return this season and we meet Jess’ (still uncast) sister. New Girl premieres Tuesday, September 17 at 9pm. Check out the season promo below. Categories: Fall Preview, Season Premieres, TV | Tags: bones, brooklyn nine-nine, dads, Dancing with the Stars, fall premieres, James Franco, Last Man Standing, New Girl, nick and jess, schmidt, shark tank, sleepy hollow, the mindy project, the neighbors, the new girl | Permalink. WARNING SPOILERS AHEAD!! DO NOT READ THIS POST IF YOU HAVEN’T WATCH THE LATEST EPISODE OF BREAKING BAD! The thirteenth episode of season 5 starts off with Todd and his twisted family pouring out a batch of non-blue meth. Todd proudly tells them that it’s 76% quality. Lydia is really unimpressed by this and wants to know when the signature blue color will form. Ha! Walt would die if he saw this mediocrity in the lab. Lydia insists that blue is their thing and the meth must be blue, even if it’s poor quality. This (pointless) scene continues with Todd making creepy passes at Lydia while discussing his poor meth-cooking skills. The scene is finally broken when Todd gets a phone call from Walt. Walt’s making the call that we saw at the end of last week’s episode informing Todd that he has a new job for his uncle (remember, Walt hired Todd’s uncle, Jack, for the massacre of nine prisoners at the end of season 5). But this time we see the entire conversation. 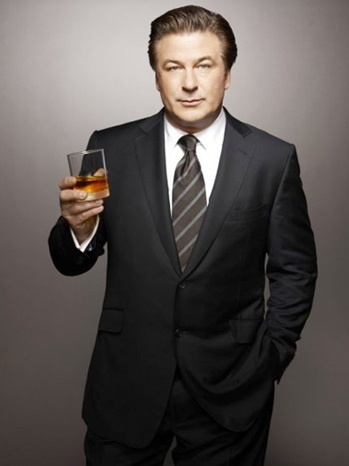 Walt is hiring Jack for one target this time and he’s not in jail. The target is Jesse Pinkman. Cue periodic table. We catch up with Hank and Jesse meeting with Gomez. Hank tells Gomez that Jesse has an idea to take down Walt. 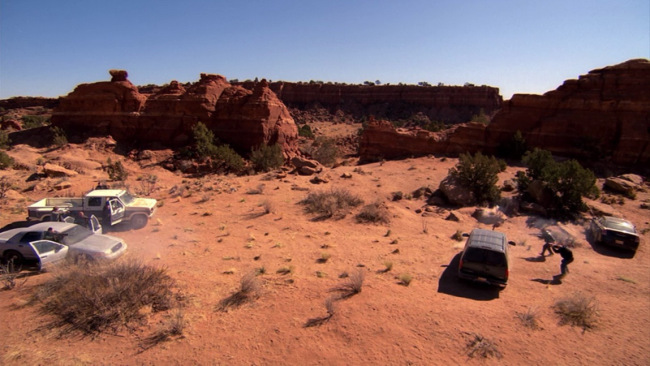 Jesse informs them that he knows there is evidence that Walt would never get rid of because of his green – his money. He tells them he doesn’t know where it is, but he thinks who knows who does and this surprising trio sets out on a mission. We watch them begin to unveil their plan, without knowing what the hell it is that they’re doing. Hank pours bloody meat all over his kitchen floor, and tells Jesse “you’re up”. Next, Hank and Gomez visit with Huell (Sauls’ bodyguard, the one that laid on the cash-stack). They tell Huell he isn’t arrested, but being held there for his own protection. They inform Huell that they interpreted a call from Walt where he stated that Jesse is his first target and Huell is his second. Huell doesn’t believe it at first, but Hank and Gomez (with the help of Jesse’s intel) spin a web of lies that convinces Huell that Saul turned him over to Walt. They even show Huell a picture of Jesse laying next to the pile of meat to prove that Jesse is dead (so the scene earlier makes sense now). Unfortunately for Hank and Gomez, Huell truly doesn’t know where the money is. But unfortunately for Walt, Huell knows a lot. He tells Hank about the seven barrels of money, the rental van, the dirt on the car, and the shovel. They leave but remind Huell of the danger he’s in and basically convince him to hang out in an apartment by himself, for his own protection. Poor Huell, he has no idea he’s being deviously manipulated. We then see Walt meeting with Todd and his family going over the plans to take care of Jesse. Jack thinks this is a case of “rat patrol,” but Walt tries to convince them that Jesse isn’t a rat. Oh Walt, if only you knew. Walt convinces them that he’s not a rat, and tells them he wants his death to be quick and painless. Walt think he’ going to pay them for this job, but then he receives a little surprise. Instead of cash payment, Jack wants Walt to pay in the form of Walt’s meth-cooking. Walt tries to rebuke, but it’s for naught. He eventually agrees to one more cook, but it will be done after the job is finished. “Time is of the essence, do you understand?” And then Walt tells them he doesn’t know where Jesse is, but he’ll flush him out and then give the order. Jesse’s time is up. And so it appears Walt does know Jesse’s weak-spot. Walt heads to Andrea’s house and visits with her and Brock. Walt pretends like he’s visiting to find out where Jesse is, and claims he hasn’t seen him or heard from him in a few days. He tells her that Jesse’s using again, and claims to have exhausted all resources for finding him. Walt tells her that they’ve had an argument, and feigns caring for Jesse’s whereabouts above all else. Andrea finally just offers to call him and leaves Jesse a message explaining that her and Walter are worried about him. Walt quickly departs, knowing he planted the seed that he needed. Walt leaves and makes a call to two men sitting in a car across the way. Walt tells them that they’re on but that when Jesse arrives, that must take him away and do it so the mother and son know nothing. 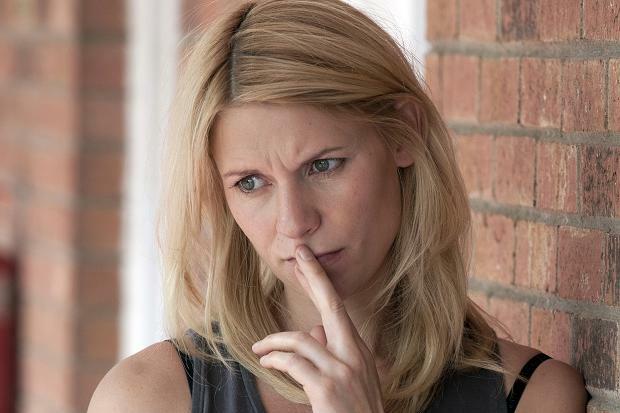 Hank intercepts Andrea’s voicemail on Jesse’s phone, but fails to report the message to Jesse. But Hank does report back to Gomez and Jesse that the rental van that Walt used to hide his money didn’t have a GPS, thanks to a law-suit from the ACLU forcing the company to remove them. But Hank has another idea. He correctly surmises that Walt buried the money, thanks to Huell’s clues about the dirty van and the shovel. Hank thinks if they can convince Walt that they found the spot where he buried the money, they can flush him out and force him to head to the spot of the money, therefore giving Hank and Gomez an opportunity to follow him and find the physical evidence they need. We finally have our first spotting of Skyler and Walter, Jr. halfway into the episode. Skyler is teaching Walter, Jr. the ways of the carwash. After ringing up a random customer, the next customer is none other than the beaten and battered Saul Goodman. Saul is there because he’s in a panic over Huell’s disappearance. Saul has no idea where he is, and he’s afraid. He warns Walt that Jesse is smarter than they think, and that Huell’s disappearance is a sign that something is not right. Then, Walt gets a picture message that changes everything. The photo is of a barrel hidden in what appears to be the desert and it’s full of cash. Walt’s phone then immediately rings. It’s Jesse asking Walt if he got his photo claiming that he found that and six more barrels. Walt flies out of the car wash and races to his spot while he listens to Jesse explain that after pistol whipping Huell, he was able to trace Walt’s rental van which included a GPS, leading Jesse right to Walt’s hiding spot. Jesse then tells a distraught Walt that he’s going to start burning the money, $10,000 at a time, until Walt gets to the spot. Walt is more distraught about this than anything I’ve ever seen before. The thought of his money burning breaks at him. He tells Jesse he’s dying and begs Jesse to stop and save the money, as it’s intended for Walt’s children. Jesse can’t believe Walt would mention children, which leads Walt into a confession about what he did to Brock and an apology. He claims he planned it for Brock to be okay. Walt then goes on to make a full confession to Jesse as he claims that everything he’s done (which he lists out, murder by murder) was to protect them and keep them safe. He tells Jesse that he’s just too stupid to realize it. Little does Walt know that he’s the one that’s too stupid to realize when he’s been duped. The van didn’t have a GPS and Hank and Jesse tricked Walt. Their plan worked perfectly. They got Walt to confess to all of his crimes AND lead them directly to his buried treasure. Walt stands there for a moment, alone and confused, until he finally sees a car heading in his direction. He tries to hide, but as soon as he realizes that Jesse was working with Hank, Walt realizes that his time is up – it’s over and there’s nothing he can do about it. Or, can he? While the car was still pulling up, before Walt knew who was in it, he called Jack and desperately relayed the coordinates of their whereabouts to him. As he was ending the call, Walt realized Jesse was with Hank and told them not to show up. Will they follow his orders? Hank calls for Walt to come out and surrender. Can it really be? Did everything on Breaking Bad lead up to this moment? It seems so, as Hank yells it’s over and Walt finally gets up and begins to walk towards Hank and Gomez, surrendering. Hank books him and reads him his Miranda Rights as Jesse looks on smiling. After Jesse and Walt squabble like children, Hank gets ready to head back into town and calls Marie. In a heartfelt moment, he tells Marie that he got him and it’s over. 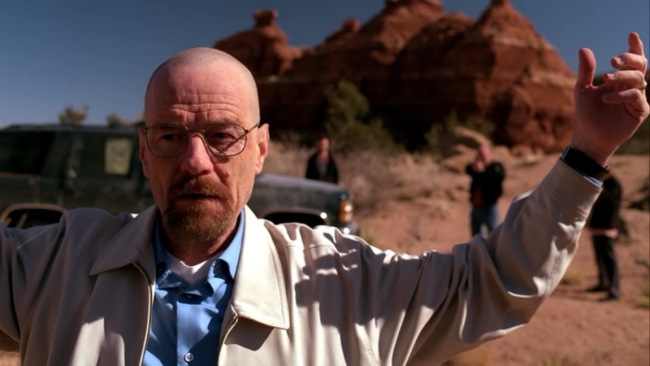 He even waves to Walt in the car on Marie’s behalf. The two exchange tearful “I love you’s” before Hank hangs up. Then, as it seems like all hope is lost for Walt, Todd and his family show up. Never one to follow directions, Jack and his boys arrive with a slew of guns and automatic weapons. Walt desperately tries to yell warnings to Hank and Gomez, but they don’t listen. With guns pointed and Walt locked and cuffed helplessly in a car between the two groups, the men stand off. Walt yells from the car telling Jack to stand down, not act, and go home, but Jack doesn’t listen. They ask for Hank and Gomez to show badges, but after they make no effort to do so, Jack and his men finally open fire on Hank and Gomez. In an epic scene with guns firing, glass shattering, and debris flying everywhere, Jack, Todd and co. fire round after round at Hank and Gomez, with Walt trapped helplessly in between. The episode comes to a shocking end with Walt trying desperately to hide on the floor in the backseat of Hank’s bullet-ridden SUV, with bullets and glass flying everywhere around him. Categories: Recap, TV | Tags: AMC, Breaking Bad, Final Season, Gomez, Hank, Jesse, Jesse Pinkman, Saul Goodman, Skyler White, Walt, Walter White | Permalink. With the summer blockbuster season drawing to a close, it’s time to head back into theaters for some of the most highly anticipated films of the year. From blockbusters to buzzworthy indies, this fall season has them all and we’re counting down our top 12 picks. Below are the movies we can’t wait to see, which one are you most excited for? Reasons to watch: That cast. That story. It promises to be an edge of your seat movie. The trailer alone makes me an emotional wreck. Also, I’m excited to see Taylor Kitsch. Finally, he’s making smart career moves and joining a great ensemble for a dramatic movie rather than trying to carry a one-dimensional, action movie on his own. In theaters for limited release December 27, 2013. Reasons to watch: Leonardo DiCaprio and Martin Scorsese, the dream team is back together. What more of a reason do you need? Oh, and this gif. In theaters November 15, 2013. Reasons to watch: I’m a sucker for a historical movie, especially if it involves JFK. 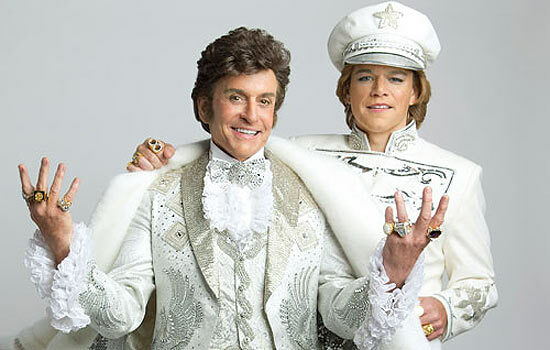 The incredible story aside, the ensemble cast is impressive and includes such names as Zac Efron, Marcia Gay Harden, Billy Bob Thorton, Jacki Weaver, and Paul Giamatti. In theaters October 4, 2013. Reasons to watch: The movie just had its premiere at the Toronto International Film Festival and has many marveling at both the technical and emotional achievements of the film. Rumor has it, Sandra Bullock is a shoo in for this year’s Best Actress award. Reasons to watch: The latest installment of the series follows the story of Katniss Everdeen (Lawrence) and Peeta Mallark (Hutcherson) as they are forced to participate in the 75th Hunger Games. This movie has a new director, new writer, and bigger budget. Here’s hoping that all of our disappointments about the first film are washed away with the sequel. And I’m more than excited to see all the new cast members like Philip Seymour Hoffman, Jena Malone, and Sam Claflin. In theaters November 22, 2013. Check out the trailer breakdown here. Reasons to watch: A lot of Oscar buzz around Matthew McConaughey’s performance, will it be worth the hype? In theaters November 1, 2013. Reasons to watch: A lot of actors playing against type. The film reunites David O. Russell with several of his favorites (Bradley Cooper and Jennifer Lawrence from The Silver Linings Playbook and Christian Bale and Amy Adams from The Fighter) so performances promise to be strong. In theaters December 25, 2013. Reasons to watch: Every list needs a campy horror flick so why not include a remake of a classic? Chloë Grace Moretz brings her skill to the title role with Julianne Moore playing the part of her deranged mother. In theaters October 18, 2013. Reasons to watch: Christian Bale, Zoe Saldana, Woody Harrelson, Casey Affleck, Forest Whitaker, Sam Shepard, Willem Dafoe… I can keep going. In theaters December 6, 2013. Reasons to watch: Directed by two-time Oscar-winning filmmaker Ron Howard, Chris Hemsworth’s performance is garnering a lot of attention (as is his 30-pound weight drop). The script was crafted by Frost/Nixon writer Peter Morgan and is being praised for its suspense and sexiness. Reasons to watch: With Terrance Howard and Hugh Jackman portraying the fathers of the missing girls and Paul Dano the potential kidnapper, the performances promise to be quite powerful. In theaters September 20, 2013. In theaters October 11, 2013. Categories: Celebrities, Countdown, Movies | Tags: american hustle, captain phillips, carrie, catching fire, Chris Hemsworth, dallas buyers club, fall movies, gravity, lone survivor, movies, oscar, oscar buzz, out of the furnace, parkland, prisoners, ron howard, Rush, stephen king, the wolf of wall street, tom hanks | Permalink.